We plan to observe solar neutrons at Mt. Sierra Negra (4,600 m above sea level) in Mexico using the SciBar detector. This project is named the SciBar Cosmic Ray Telescope (SciCRT). The main aims of the SciCRT project are to observe solar neutrons to study the mechanism of ion acceleration on the surface of the sun and to monitor the anisotropy of galactic cosmic-ray muons. The SciBar detector, a fully active tracker, is composed of 14,848 scintillator bars, whose dimension is 300 cm × 2.5 cm × 1.3 cm. The structure of the detector enables us to obtain the particle trajectory and its total deposited energy. This information is useful for the energy reconstruction of primary neutrons and particle identification. 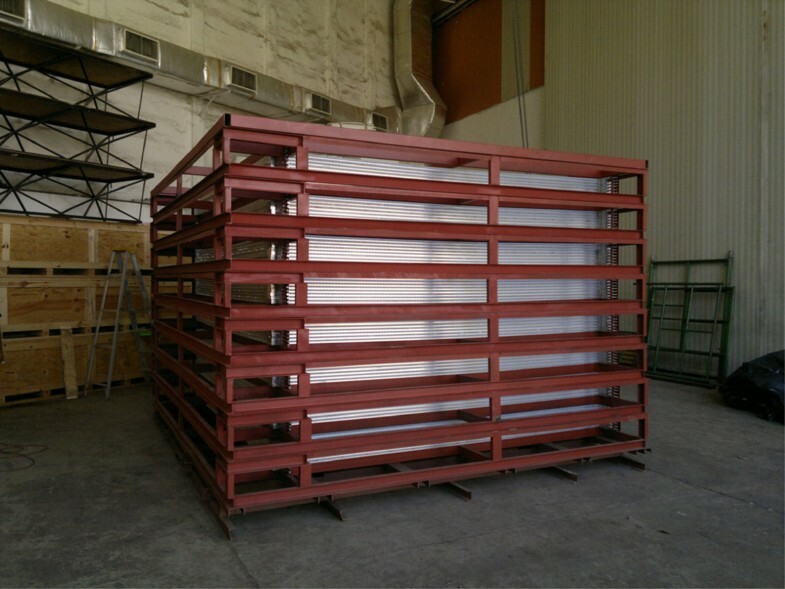 The total volume of the detector is 3.0 m × 3.0 m × 1.7 m. Since this volume is much larger than the solar neutron telescope (SNT) in Mexico, the detection efficiency of the SciCRT for neutrons is highly enhanced. We performed the calibration of the SciCRT at Instituto Nacional de Astrofisica, Optica y Electronica (INAOE) located at 2,150 m above sea level in Mexico in 2012. We installed the SciCRT at Mt. Sierra Negra in April 2013 and calibrated this detector in May and August 2013. We started continuous observation in March 2014. In this paper, we report the detector performance as a solar neutron telescope and the current status of the SciCRT. The particle acceleration mechanism on the solar surface has been studied through multi-wavelength observations. High-energy particles are produced related to solar flares. There are two kinds of particles accelerated at the time when a solar flare occurs, i.e., electrons and ions. Information of electron acceleration is obtained by hard X-ray, radio wave, and H α bright line observations. On the other hand, very high-energy protons come to the earth and are sometimes observed. It is, however, difficult to understand the ion acceleration with the information of protons since they are affected by the interplanetary and geomagnetic fields. Gamma rays and neutrons produced by the interaction of accelerated ions and the solar atmosphere are sometimes used to study the ion acceleration as they are not affected by the magnetic field. Ion acceleration has been mainly studied by gamma ray observation. The Reuven Ramaty High Energy Solar Spectroscopic Imager (RHESSI) was the first gamma ray imaging observatory for solar flares; its results revealed that there are differences between ion and electron acceleration foot point locations for several flares (Hurford et al. 2006). Furthermore, the Fermi Large Area Telescope (LAT) can observe high-energy gamma ray emission (>100 MeV) from the sun. Such high-energy gamma ray emission is generated from pion decay produced by the interaction between accelerated ions and the solar atmosphere. Fermi LAT observed impulsive and long duration gamma ray emission on 7 March 2012 (Ajello et al. 2014). Solar neutrons have been observed by the near-earth spacecrafts and ground-based detectors. Although solar neutrons are attenuated by the earth’s atmosphere, high-energy neutrons (>100 MeV) may be detected by ground-based detectors. Solar neutron telescopes (SNTs) have been installed near the equator at high-altitude mountains; several solar neutron events were observed (Sako et al. 2006; Watanabe 2005). Since SNTs have a target scintillator for stopping neutron-induced proton and record counting rates when the energy of the recoil protons exceed the energy threshold level, it is not possible to record the energy of neutrons, event by event. The SciBar Cosmic-Ray Telescope (SciCRT) project has been proposed as a brand new cosmic ray experiment using scintillator bars. The SciCRT is a multi-purpose cosmic ray detector. The main purpose of the SciCRT is 1) solar neutron observation for studying ion acceleration mechanism and 2) muon observation for investigating the anisotropy of Galactic Cosmic Rays (Kato et al. 2014; Nagashima et al. 2012). We performed the calibration of the SciCRT at Instituto Nacional de Astrofisica, Optica y Electronica (INAOE) in Mexico in 2012. The SciCRT was installed at Mt. Sierra Negra (4,600 m) in April 2013 and was calibrated in May and August 2013. 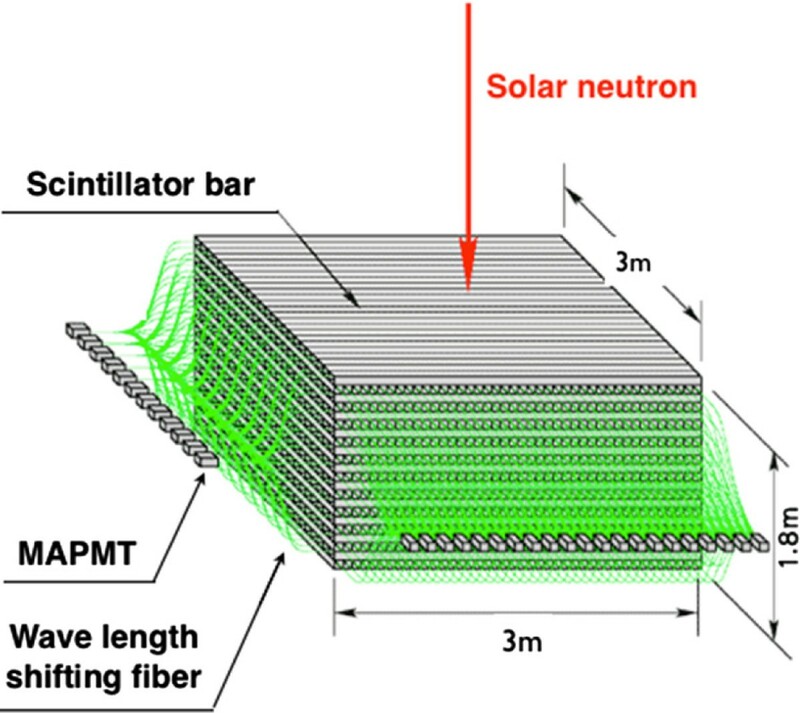 In this paper, we will describe the performance of the SciCRT as a solar neutron detector. The SciBar detector was initially developed for the K2K neutrino oscillation experiment in Japan (Yoshida et al. 1999). We can use this detector as a solar neutron telescope if we replace the direction of the accelerator beam by that of the sun. This new type of the solar neutron telescope has 1) a larger effective area than the current SNT, 2) enough energy resolution to determine the energy spectrum of solar neutrons with higher precision, 3) an ability to detect lower energy neutrons, and 4) particle identification ability.Multianode photomultiplier tubes (MAPMTs) are attached to two sides, named ‘X’ and ‘Y’. A combination of two planes with 116 scintillator bars orthogonally attached makes 1 layer and there are 64 layers in total as shown in Figure 1. The top and bottom layers play a role in 1) four-fold coincidence planes of the muon detector and 2) anti-layers of solar neutron detector simultaneously. The top and bottom layers consist of the uppermost and bottommost two planes, each plane is named as upper and bottom X,Y. The other layers of the SciBar are longitudinally divided in eight components, each of which is called a super block (SB, see Figure 2). At the moment, we are using 5/8 of the full detector. We will improve this ratio in the near future. Schematic view of the SciCRT (KEK/High Energy Accelerator Organization 2003). The SciCRT is composed of 14,848 scintillator bars, whose dimensions are 300 cm × 2.5 cm × 1.3 cm. Each layer is made of two planes with 116 scintillator bars orthogonally attached; there are in total 64 layers. Scintillation photons generated by cosmic ray signal go through wavelength-shifting fibers (Kuraray Y11(200)MS) and are read out by using the 64-channel multianode PMTs (HAMAMATSU H8804). A picture of super blocks. A picture of the whole detector divided into eight super blocks (SBs). One SB is composed of 1/8 SciCRT supported by the steel-based structure to prevent the scintillator bars from deflecting by gravity. For the time being, we use the data acquisition (DAQ) system developed for K2K experiment (Yoshida et al. 1999). 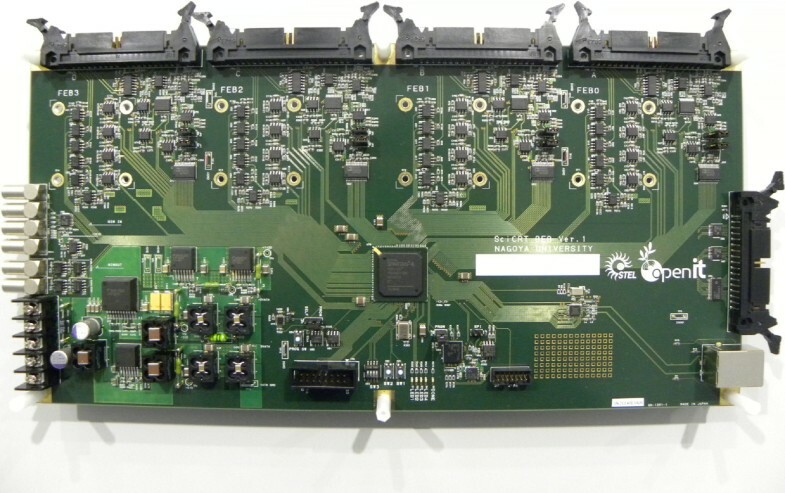 There are three components configuring the DAQ system, i.e., front-end board (FEB), back-end board (BEB), and trigger board (TRGB). We will describe the flow of the DAQ system hereafter. If more than 1 of the 32 channel signals from one MAPMT exceed the threshold level energy, a hit signal is generated on the FEB and sent to the TRGB via the BEB. 2) Several hit signals are collected on the TRGB. These signals are the test to decide if the neutron trigger condition is satisfied or not. A hold signal is generated if the trigger condition is satisfied. 3) The hold signal is sent to the FEB. The pulse height of each channel signal is kept until the hold signal reaches to the FEB. 4) The pulse heights are digitalized on the BEB. These digitalized values, named ADC data, have the deposited energy information at each channel. 5) ADC data is transferred to a DAQ personal computer (PC) via VME bus. We need to keep the dead time in mind. Due to the limit of VME bus transfer, the transfer of ADC data is limited up to 1 kHz per one BEB. We are now developing new fast readout electronics. We will describe our new electronics later. The system of our DAQ hardware trigger is closed in each SB, since the trajectory of high-energy neutron-induced protons seldom penetrate over two SBs. This also mitigate the effect of dead time. To determine the detection efficiency of the SciCRT for neutrons, we estimated the effective area with each combination of incident angle and injected energy. Figure 3 shows the relationship between the incident energy of neutrons and the effective area. We can achieve a large effective area (>50 MeV) for the SciCRT in comparison with that for the Mexico SNT (González et al. 2010). The detection efficiencies for neutrons by the SciCRT and the Mexico SNT are 10% and 1%, respectively, in case of 100 MeV primary energy and 28% and 13.5% in case of 1 GeV primary energy, respectively. As the incident energy becomes smaller, the difference in the efficiency becomes greater between the SciCRT and the SNT. Detection efficiency for neutrons. Relationship between the energy of incident neutrons and the estimated effective area injected with five different zenith angles. The azimuth angle and injected direction are chosen randomly for each event. 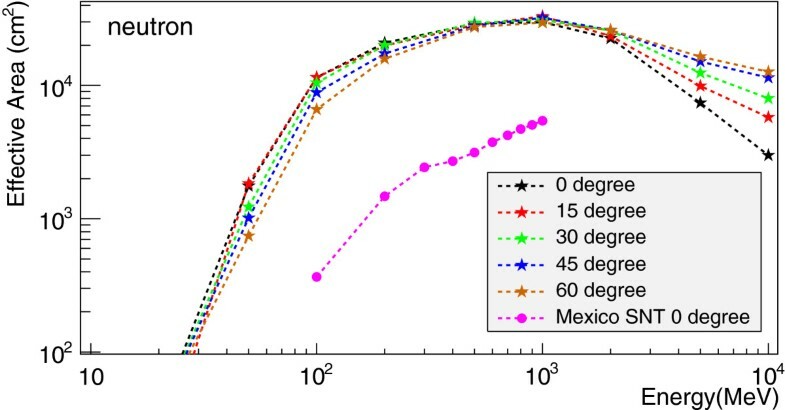 The pink plots show the effective area of vertical injection of particles on the Mexico SNT calculated by the detection efficiency (González et al. 2010) and detector size (4 m2) (Nagai et al. 2014). The Mexico SNT is composed of proportional counters (anti counters) at the top, scintillation counters in the middle and proportional (directional) counters underneath. Scintillation counter consists of a 4-m2 array of 30-cm thick plastic scintillator with four energy thresholds (30, 60, 90, 120 MeV). The Mexico SNT records the count rates with anti-coincidence for each threshold. The SciCRT may also obtain the count rates with anti-coincidence with a threshold (7 MeV) determined by a MC calculation. Figure 4 shows the time profile of neutrons triggered for the SciCRT obtained by a Monte Carlo (MC) simulation and for the Mexico SNT assuming the flux from the solar neutron event on 7 September 2005 (Sako et al. 2006). The parameters of the MC simulation are listed as follows. 1) The energy spectrum of neutrons at the sun is represented by a power law as 6.1 ×1027 (E/100 MeV) -3.8 MeV -1 sr -1. 2) Neutrons are emitted impulsively at the sun. 3) The solar zenith angle is 17°.5. The propagation of solar neutrons through the earth’s atmosphere is calculated using the Shibata program (Shibata 1994). A time profile of the event on 7 September 2005. These are three kinds of time profiles from the solar neutron event on 7 September 2005, e.g., the MC calculation of the SciCRT, the data, and the MC calculation of the Mexico SNT. The Geotail hard X-ray peak time is 17:36:40 UT shown by a dot dash line. The vertical axis shows the count rates per 2 min on the left and the significance on the right. These vertical axis are normalized by the standard deviation calculated from background. The black line shows the data corresponds to the neutral channel (>30 MeV) on Mexico SNT. 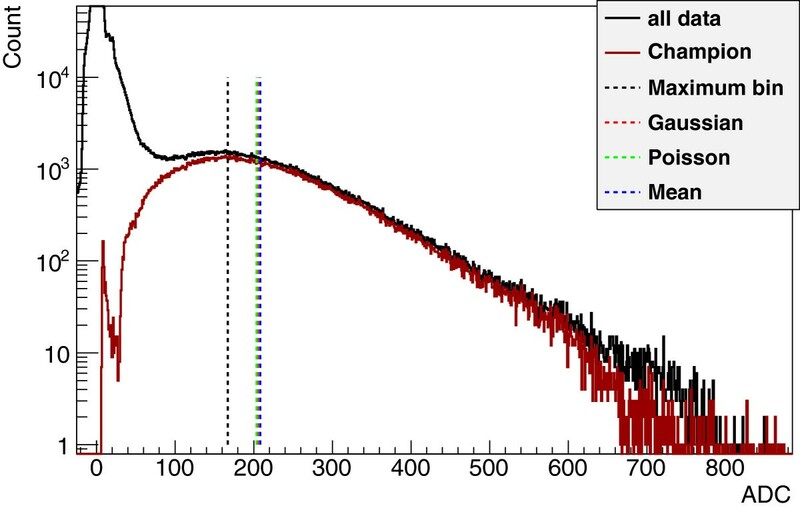 The red line is the best fit to the data assuming impulsive eruption of solar neutrons. These significance for the count rates per 5 min become 17, 32, and 53 σ, respectively (Nagai et al. 2014). According to this calculation, the sensitivity of the SciCRT for neutrons is 1.9 times higher than that of the Mexico SNT. This sensitivity of the SciCRT for neutrons, however, is limited by the readout speed of the BEB developed for the neutrino oscillation experiment. Therefore, we are developing a fast readout BEB via Ethernet LAN (Sasai et al. 2013) (see Figure 5). We will achieve 3.1 times enhanced sensitivity than that obtained by the current SciCRT. A picture of the new BEB for fast readout. To achieve fast readout of ADC data, we adapt data transfer system via Ethernet LAN using 100 Mbps SiTCP (Uchida 2008). In this system, a transmission control protocol (TCP) and an Internet protocol (IP) are employed for data transfer from the BEB to the DAQ PC and a user datagram protocol (UDP) is used for slow control from DAQ PC to the BEB. One BEB can read four FEBs. This BEB may achieve ten times the readout speed of the current BEB. Figure 6 represents the relationship between the total deposited energy and injected energy of background neutrons simulated by the Particle and Heavy Ion Transport code System (PHITS). It is possible to define the function to reconstruct the incident energy of neutrons from the total deposited energy in the scintillator bars (see the upper right panel), although the deposited energy measured is that of recoil proton. Relation between the primary neutron energy and neutron-induced proton energy. The left panel shows a correlation between the primary energy and the total deposited energy when background neutrons are injected to the detector. The black solid line means a linear function in case of completely reconstructed. The upper right panel represents the mean and the deviation of deposited energy for each injected. The lower right panel shows the ratio of deposited energy to injected (Nagai et al. 2014). The SciCRT started continuous observation at Mt. Sierra Negra in April 2014. For continuous observation, the gain and the threshold level must be adjusted to all MAPMTs. The gain is adjusted by changing voltages to the MAPMTs using the peak value of minimum ionization particle (MIP). The threshold level is controlled by the digital to analog converter (DAC) in the BEB. The requirements of these values differ between muon/anti and neutron layers. The threshold is calculated by MC simulation, that the deposited energy becomes 7 MeV for neutron layers and 0.3 MeV for muon/anti layers. The peak of MIP and the threshold level for muon/anti layers are set to 300 and 70 ADC values, respectively. Those for neutron layers are set to 14 and 90 ADC values. We calibrated the detector for background cosmic ray with muon trigger mode and obtained the ADC histogram to determine the gain and threshold.There are 150 MAPMTs when we use 5/8 of the full detector, each MAPMT has a different gain. We need to optimize supplied voltages by a simple method. We define ‘Champion’ as the channel which records the highest ADC value in one side of one horizontal plane for each cosmic ray event. Figure 7 shows the ADC histogram of one MAPMT for all data and Champion obtained by muon/anti layers. The peak of the ADC histogram is determined using four methods, i.e., maximum bin, Gaussian, Poisson and mean.We accommodate this method to the neutron layers. However, since the required peak of MIP for neutron layers is very close to the pedestal histogram, it is difficult to separate between the pedestal and ‘Champion’ histogram. Therefore, it is necessary to adopt a criterion to select events. Due to selection of a muon-like event, Champion position of neutron layers is compared with that of muon/anti layers. The blue line shows the ADC distribution using this criterion in Figure 8.Figure 9 shows the trajectory of a neutron-like event. Color at each pixel represents the relatively scaled deposited energy. Since the upper edge of this trajectory starts from the middle of the detector, it may be a trajectory of a neutron-induced proton. As this particle has a significant energy loss at the end of the trajectory, this may be the Bragg peak. This feature can be useful for particle identification, especially to discriminate a neutron from a gamma ray. An example of the ADC histogram for muon/anti layers. The ADC histogram represents the data obtained by one of the MAPMTs at muon/anti layers. The black and red line show all data and ‘Champion’ histogram. The dotted lines show the result of the peak channels when fitting different analytical curves or simply finding the maximum in (see text) the histogram of Champion (Nagai 2014). An example of the ADC histogram for neutron layers. This example shows the ADC histogram obtained by one of the MAPMTs for neutron layers. The green line shows the ‘Champion’ histogram. The blue line shows the histogram using the ‘muon-like’ criterion (Nagai 2014). An example of the trajectory of neutron-like event. This example shows the trajectory obtained in both sides of one SB. The color scale represents the significance of the deposited energy. There is a significant energy loss at the end edge of the trajectory. The primary particle might be a background neutron. We installed the SciCRT as a multi-purpose cosmic ray detector at Mt. Sierra Negra (4,600 m) in eastern Mexico. We especially discussed its capabilities for solar neutron observation. The energy resolution of the SNTs and its sensitivity is not sufficient to elucidate the acceleration mechanism of ions. The detection efficiency of the SciCRT for neutrons is estimated to be ten times higher than the Mexico SNT, especially at the low-energy region. The sensitivity of the SciCRT will be 1.9 times higher than the current Mexico SNT as shown by a Monte Carlo calculation. We are planning to upgrade electronics to resolve the inconveniently high dead time that cause a limited sensitivity of the SciCRT. The new electronics will improve 3.1 times the sensitivity compared with the Mexico SNT. Since the SciCRT is a fully active scintillator tracker, we can reconstruct the direction and deposited energy of every particle crossing through. We calculated the relationship between the primary neutron energy and neutron-induced proton energy and obtained the function to reconstruct the primary neutron energy. We expect to detect solar neutron events with the SciCRT during remaining solar cycle 24. We are grateful for the group of the SciBar and SciBooNe experiment for allowing us to use the SciBar as a cosmic ray detector. This work was supported by Grants-in-Aid for Scientific Research (B) 22340054, Scientific Research (C) 23540348 and Fellows 24340054 from JSPS. Grants from CONACyT (181879-I) and PAPIIT-UNAM (IN107911) are also acknowledged. This work is also supported in part by the joint research program of the Solar Terrestrial Environment Laboratory (STEL), Nagoya University.